Is it possible to create something like global warming, using cold winters? Isn't global warming supposed to have the result that the globe is actually warming (hence the name)? This article shows how it was done. It is said that figures don’t lie, but liars sure do figure. If an organization set out to stop the world from using oil and coal, plus natural gas if possible, an excellent way to do this would be to find a way to “prove” that the CO2 produced from burning such fossil fuels causes the entire planet to heat up at an alarming rate. The over-heated planet would experience great upheavals such as coastal flooding from rising sea levels, polar ice caps melting, increased number and strength of tropical cyclones (hurricanes), severe droughts but also floods, greater spread of terrible tropical diseases, and others. One would use temperature data, but would first massage the data just a bit to use “anomalies” instead of actual temperatures, where anomalies are the differences between actual temperatures and expected or “normal” temperatures. This is, by the way, an excellent way to “hide the decline,” but that is a topic for another post. Instead of displaying actual temperatures for thousands of towns and cities and rural areas and oceans, to minimize confusion one would combine all the anomaly data into a single line on a chart, such that the line shows a rapid increase during the past 25 to 30 years. This one chart would then be used in presentations world-wide, and in official publications, to persuade policy-makers to enact legislation and approve treaties to curb fossil fuel use. Sound familiar? It should. A number of organizations did this, among other things, to create a climate crisis. This article will show a portion of how that crisis was created, using nothing but a few cold winters. Can cold winters create a global warming crisis? That sounds counter-intuitive, or perhaps plain wrong. But, it can. Why would anyone (or organization) want to do all the above, plus refuse to publish the underlying temperature records for the thousands of locations world-wide? If the underlying data showed that CO2 cannot be the cause of the warming, or if the warming was not really occurring, one would not want the underlying data published. A bit of a digression here, to discuss how a trend in temperatures can be determined. More basically, how a trend can be found for any set of data. This is very elementary statistics, found in almost every good statistics textbook and online in several places. The basic principle is the same as a teeter-totter, or see-saw on a playground. A see-saw has a horizontal board that is supported in the center, and each end goes up and down opposite the other end. The trend line is much like the horizontal board. Depending on the data, the trend may be up or down. The trend is also referred to as the slope of the line that best “fits” the data. In statistics-speak, the trend line is a straight line that minimizes the sum of the least squares of the differences, but that is beyond the scope of this article. If data is about the same over a given time frame, some data points higher and some lower, there is no trend up or down. This would be like balancing the see-saw with each end at the same level. (Figure 1). Modern spreadsheet technology simplifies the trend-line calculation, such as Microsoft Excel ™. Figure 1 shows a formula Y = .0031x + …, this is the equation of the trend line, with 0.0031 the slope of the line, or the trend. This is very close to zero, or no trend either up or down. Now, if one were to simply decrease the values of a few of the numbers at the lower left corner of the figure by a very small amount, such as shown in Figure 2, the trend line increases to 0.0357. Only eight data points were changed, out of 360 data points in the graph. (see circled portion) Yet, the slope of the trend line changed by almost a factor of twelve. The significance of this will be shown in a moment. The data for Figure 1 and Figure 2 are taken from the Hadley Center’s Climatic Research Unit’s data that they voluntarily released into the internet, for Boise, Idaho, in the U.S.A (Boise is file 726810). The x-axis is in years, and the y-axis is degrees C for the average monthly temperature at Boise from 1940 to 1970. Boise was chosen for Figure 1 and Figure 2 because the period from 1940 to 1970 has almost zero trend. The temperature trend for the last 25 years of the 20th century, plus the first nine years of the 21st, in Abilene, Texas, was upward at the rate of 0.0312 degrees C per year, or an alarming rate of 3.12 degrees C per century. (Figure 3). See the equation Y = 0.0312x - 44.031, where the value 0.0312 is the slope of the trend line. The climate alarmists maintain that man’s emissions of CO2 caused such a rapid increase world-wide, and further increases in CO2 will create additional catastrophic global warming. 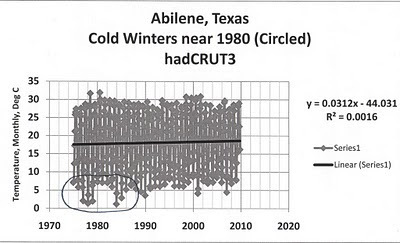 Yet, the data for Abilene shows the same pattern from Figure 2 above, that is, much colder winter temperatures from 1976 to 1985, but not warmer summers. These colder temperatures are circled on Figure 3. These circled winter temperatures were not colder than those recorded since the 1880’s. The unique aspect is that several winters in succession were colder than normal. The succession of cold winters “tipped the see-saw” downward on the left, and upward on the right, thus creating the appearance of a rising temperature, or warming trend, when there clearly was none. The maximum summer temperatures for Abilene are no greater than for previous years, and the most recent winter temperatures are actually colder than several earlier periods during the previous 120 years (see Figure 4). 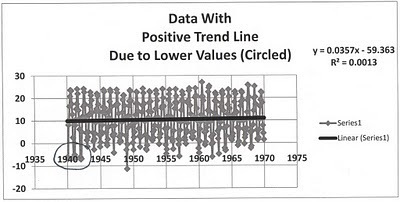 As shown above in Figures 1 and 2, the trend line can be increased by a factor of twelve when data such as the colder winters around 1980 appear. The similarity between the lower left portions of Figure 2 and Figure 3 is apparent. No, the simple fact is that there is no warming in Abilene, but there were a few cold winters around 1980. And that is how the climate “scientists” “created” global warming where there is none (this is, at least, a part of the story). Other parts of the false global warming story were told by E.M. Smith on his Chiefio blog. Smith shows how the temperature record was tampered with to produce an apparent warming: by adding thermometers in warm places, and deleting thermometers from cold places over the years. Joseph D’Aleo and Anthony Watts also published (free for download) a compendium of articles with references showing the tampering with the world’s temperature record. The false warming shown in Abilene, created by colder winters around 1980, would be easily dismissed if this had only happened at one site. But it happened in many, many locations. In the USA alone, and again using data from Hadley and their voluntarily released CRU3 data, this false warming occurred in at least 15 other towns and cities, including San Antonio, Texas; Oklahoma City, Oklahoma; Columbus, Ohio; Meridian, Mississippi; Cape Hatteras, North Carolina; New Orleans, Louisiana; Concordia and Dodge City, both in Kansas; Evansville, Indiana; Peoria, Illinois; Boise, Idaho; Des Moines, Iowa; Miami, Florida; Grand Junction, Colorado; and Montgomery, Alabama. There are sure to be others, however, I have not yet completed graphing all 80-plus locations in the USA data. UPDATE 1: (January 30, 2010) Have finished analyzing 45 out of 87 cities/towns in the HadCRU3 data released onto the internet, just a bit more than 50 percent of the total. The results and conclusions that can be drawn from 50 percent of the data will not be far off from the final results, so here's a report now. I am working on posting have posted graphs showing the temperature trends for each several of the cities, with more to follow. This will likely be in one or possibly several other posts with links in and to this post. The Abilene effect is indeed prevalent across most of the USA, excepting the dry desert Southwest and far West coast. A series of cold winters from 1976 to 1985 created the illusion of global warming. The average trend, counting all 45 files analyzed thus far, for the 25 years from 1975 to 2000, is upward at 4.5 degrees C per century (0.045 degrees C per year). However, this is almost exactly matched by the upward trend from 1910 to 1940 of 4.1 degrees C per century (0.0409 degrees C per year). The intervening years, 1940 to 1970, show almost zero temperature change at -0.7 degrees C per century (-0.0070 degrees C per year). The city with the greatest warming during 1975 to 2000 is Del Rio, Texas, with 8.8 degrees C per century. Next greatest is Columbus, Ohio (8.2 degrees C per century), followed by New York City, New York (7.8 degrees C per century). However, Washington, D.C. had the greatest cooling during 1975 to 2000, at a rate of 9.7 degrees C per century. As shown earlier, Los Angeles, San Diego, and Eureka, all in California, also cooled during that 25 year period. UPDATE 2: (Feb 4, 2010) The final results do not change much with all 87 U.S. cities completed, as expected. The upward trend from 1975 to 2000 is 4.0 degrees C per century, still matched by the rise from 1910 to 1940 of 4.3 degrees C per century. The 1940 to 1970 period remains flat at -0.5 degrees C per century. Cities with rapid temperature increases from 1975 to 2000 also include Reno, Nevada at 9.0 degrees C per century, and Providence, Rhode Island at 9.7 degrees C per century. The conclusion is clear: there is no global warming due to CO2 emissions into the atmosphere, but there is deliberate selection of a statistical quirk in the data for the final quarter of the 20th century. A few colder winters in the decade from 1976 to 1985 caused an increasing temperature trend. Climate scientists seized on this, coupled it with an increase in fossil fuel consumption during the same period, and declared fossil fuel burning (man’s activities) to be the cause of global warming due to increased CO2. Thanks for the kind words. Was great to see you again and visit last night. I'll look into that link, thanks again.